Earth looks very different from 250 million miles away. Growing up near Mars, Al never imagined traveling far from home. In an exploration of a surrounding galaxy, Al's spaceship collides with a satellite and sends his ship spiraling towards our planet. In this new world, Al attempts to make the best of the situation. 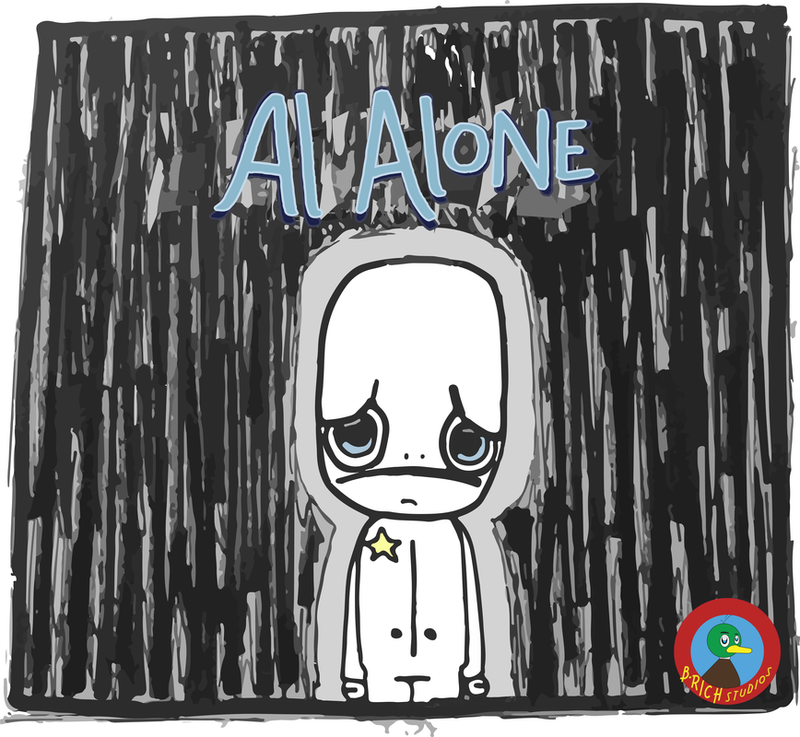 Watch all of his experiences among human society unfold in Al Alone by B-RICHstudios. Al Alone is a series of comics that will be used to show the good, the bad, and everything inbetween. I want the emotions to be real and the humor to be funny. Growth and societal critique are two ideas I plan to utilize as the strip continues. I truly hope that readers enjoy and want more of this series. Al Alone is the type of project I've been wanting to take on for a very long time and I am now ready to watch my ideas come to life. Don't we all feel like an alien sometimes? shirts, hoodies, mugs, posters, stickers, bags, AND phone cases! Click the button below to be directed there. Video games are an obvious inspiration of mine. I started drawing in fourth grade and created comics in spiral-bounds on the playground. My first comic was "Ben's Journey" which was essentially a Zelda ripoff. I got my first sketchbook in 5th grade and continued drawing until I came across Flipnote Studio animation. Since those days, I've taken multiple art course covering a variety of mediums. Currently, my interests lie in ink drawing and creating images through Adobe Illustrator. At this time, I'm still unsure where my art jounry will lead me. I plan on continuing to make content, including my comic Al Alone, and I have recently opened an online shop where you can buy my designs on stuff! ​I just want to share my art with others, interact, and create things that others enjoy while having fun myself. For now, I'm working my way towards my Art degree at McKendree University with an expected graduation in Spring 2018.